Pune regional transport officer B.I Ajri said that the machine was expected to be installed at RTO’s Alandi facility by March. Once the equipment is installed, more commercial vehicles can undergo break tests. 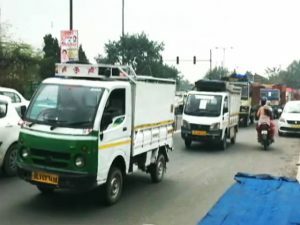 The Pune regional transport office (RTO) is all set to get a roller brake testing machine, which will put an end to the traditional process of brake testing on small commercial vehicles like auto-rickshaws and small pickup trucks. Pune MP Anil Shirole has sanctioned Rs 50 lakh for the machine. Pune regional transport officer B.I Ajri said that the macine was expected to be installed at RTO’s Alandi facility by March. Once the equipment is installed, more vehicles can undergo break tests. “We expect to install the equipment at the Alandi facility by March. Every day, many small commercial vehicles, especially auto rickshaws, come to Alandi for fitness test, which include testing the vehicle’s brakes. While the traditional method is followed at present, we expect that with the new equipment in place, more number of vehicles will be able to undergo the test. When it comes to heavy commercial vehicles, their fitness tests take place at Dive near Purandar,” the senior official told TOI. Every day, around 200-250 vehicles come to the Alandi facility for fitness test. The test takes place once a year for commercial vehicles. The traditional method involves making vehicles run at different speeds on a 250-meter track with instructors and inspectors asking drivers to apply brakes at specific points. The inspectors then calculate if the brakes of the vehicle are working fine or not,” another RTO official said. The city currently has more than 45,000 auto rickshaws and around 10,000 pickup vehicles. With the RTO opening fresh registration of auto rickshaws last year, the number is expected to see a further rise. “For us, fitness test is a struggle considering the fact that so many vehicles undergo the test and sometimes things get delayed by two days or more. If the RTO is introducing a new machine which can slash waiting time, it is a good move. On an average, a vehicle takes about half an hour or sometimes even more to complete fitness test,” Raju Shinde, an auto rickshaw driver, said.